At this time last year, net lease REITs were going through an existential crisis. Analysts questioned the viability of the business model built on accretive acquisition-fueled growth. 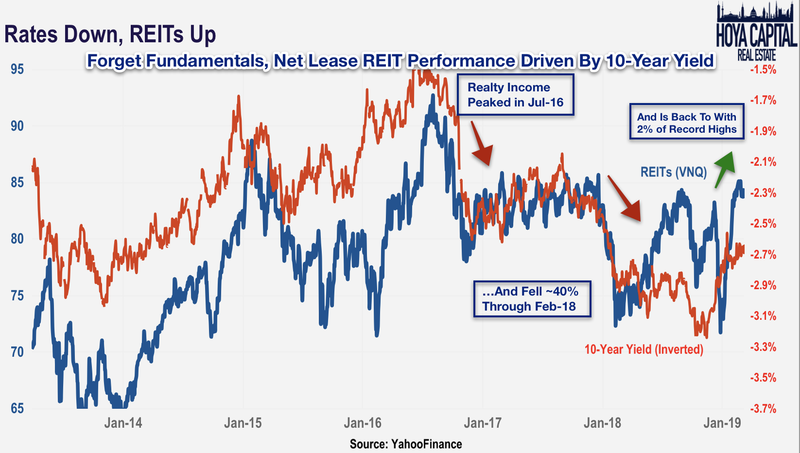 Just as "rates up, REITs down" punished the sector in early 2018, net lease REITs have bounced back sharply as rates - and inflation expectations - have receded. 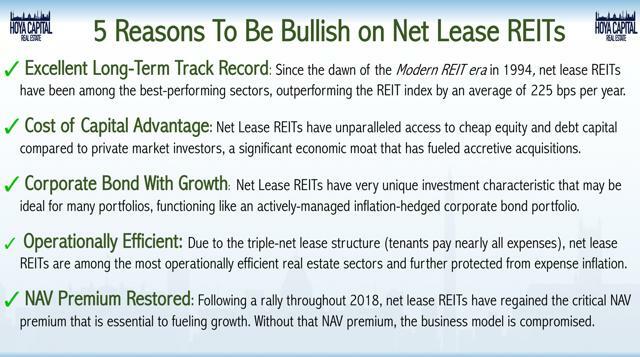 Since last February, the sector has surged roughly 50%, led by the upper echelon of the sector, the "Power 3" net lease REITs: Realty Income, National Retail, and Store Capital. These three REITs acquired more than $4 billion of assets in 2018, a staggering figure considering the pressure from Wall Street analysts last year to scale back external growth targets. The Power 3 weathered the storm in 2018 and now command the most favorable cost of capital in years, potentially reigniting AFFO growth if macroeconomic conditions can finally cooperate. In our REIT Rankings series, we analyze each of the commercial and residential real estate sectors. We analyze and categorize REITs within the sectors based on both common and unique valuation metrics, presenting investors with numerous options that fit their own investing style and risk/return objectives. We update these rankings every quarter with new developments. We encourage readers to follow our Seeking Alpha page (click "Follow" at the top) to continue to stay up to date on our REIT rankings, weekly recaps, and analysis on the REIT and broader real estate sector. Net Lease REITs comprise roughly 7% of the REIT Indexes (VNQ and IYR). 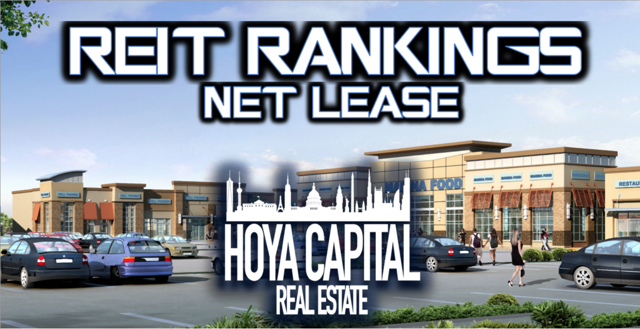 Within our Hoya Capital Net Lease Index, we track the seven largest REITs within the sector, which account for roughly $60 billion in market value: National Retail (NNN), Realty Income (O), Spirit Realty (SRC), STORE Capital (STOR), VEREIT (VER), EPR Properties (EPR), and W.P. Carey (WPC). Net lease REITs generally rent properties with long-term leases (10-25 years) to high credit-quality tenants, predominantly to retail and restaurant tenants. "Net lease" refers to the triple-net lease structure, whereby tenants pay all expenses related to property management: property taxes, insurance, and maintenance. Most leases have contractual rent bumps, often tied to the CPI index, but some REITs take on more inflation risk than others. Like a ground lease, triple-net leases result in long-term, relatively predictable income streams. These companies hold the long-term, capital-intensive real estate assets that other companies off-load in order to free up capital for their primary business operations. Assets are often acquired in sale-leaseback-type transactions through existing relationships, thus avoiding brokerage fees and other transaction-related costs. 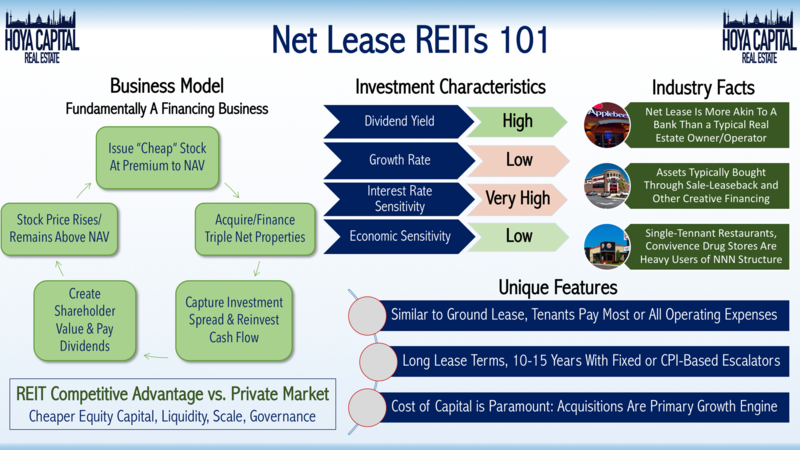 Similar to a bank, net lease REITs essentially capture the "spread" between the acquisition cap rate and their cost of capital. Access to capital and cost of capital are the defining competitive advantages of the industry. Historically, the advantages of the REIT structure (liquidity, reliable dividends, ability to diversify, good corporate governance) have allowed these REITs to command favorable costs of equity capital relative to their private market peers. As we'll discuss throughout this report, changes in the cost of capital (higher interest rates and/or declining equity valuations) can have significant ramifications for the underlying business performance. Above we show the size, geographical focus, leverage, and quality focus of the seven net lease REITs. Note that the "quality focus" is based on the credit quality of the tenants. High-quality tenants tend to be larger, more established companies with investment-grade credit ratings. Realty Income has the highest percentage of investment-grade tenants followed by National Retail. Spirit Realty and STORE Capital focus on smaller, non-investment grade tenants and thus acquire properties at higher initial yields. We also note the credit rating and industry diversification of these seven net lease REITs. 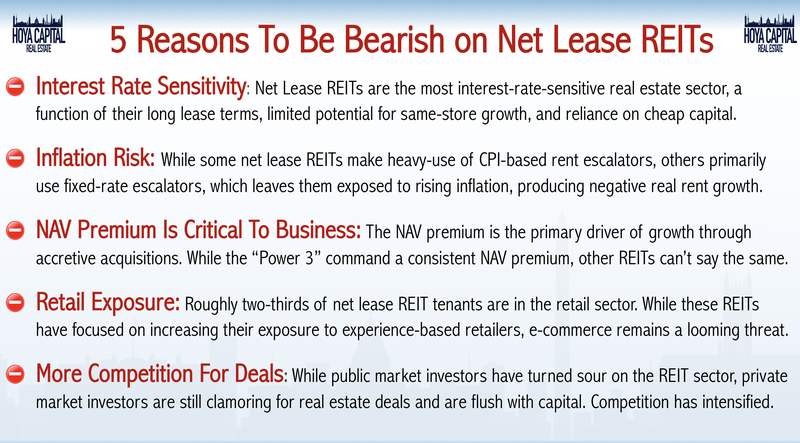 Net lease REITs are the most polarizing real estate sector given their exposure to interest rates and retail, two factors that many investors deliberately seek to avoid. 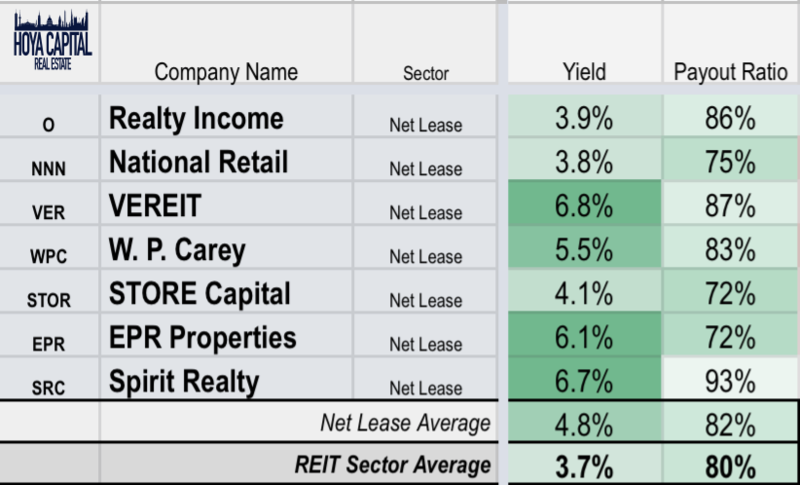 While the "Rates up, REITs down" mantra may not be reflective of the broader REIT sector, for net lease REITs, there is no doubt that interest rates (specifically, the 10-Year Yield) have been the single most significant determinant of share price performance in recent years. 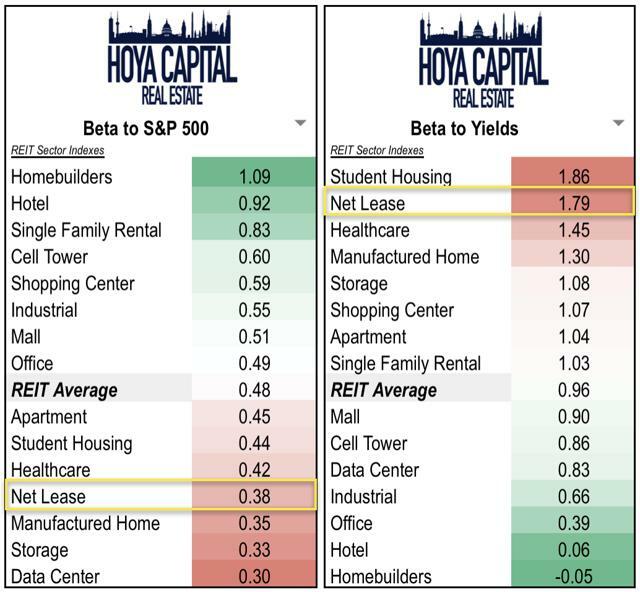 By the nature of the portfolio compared to other REITs, net lease REITs typically function more like a financing company rather than an operating company, assuming more interest rate risk than other real estate sectors. Historically, external growth fueled by a favorable cost of capital has contributed to the sector's significant outperformance relative to other REIT sectors. Net lease REITs are quintessential bond alternatives and thus highly sensitive to interest rates, and less sensitive to fluctuations in economic growth expectations relative to other REIT sectors. In many ways, these companies can be viewed as an inflation-hedged, long-duration corporate bond that has additional elements relating to leverage and potential for external growth. 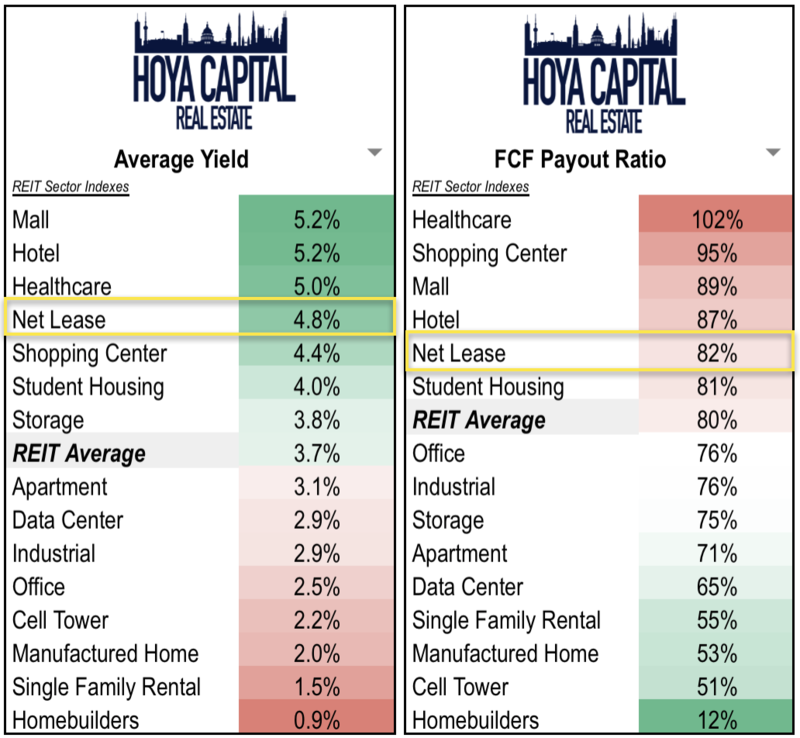 For most net lease REITs, the underlying "credit" primarily relates to the health of the retail industry. As a result, valuations are sensitive to movements in risk-free yields, credit spreads, and the health of the retail sector. The competitive advantages inherent in the REIT model - most notably the access to equity capital - are perhaps best illustrated through the long-term performance of the net lease REIT sector. 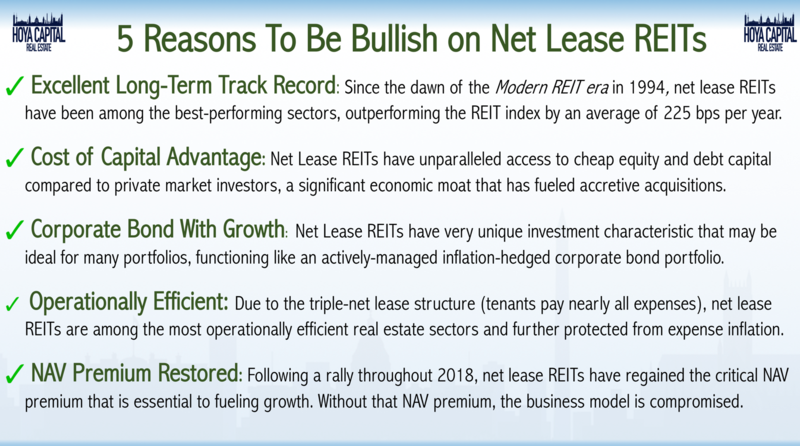 Since the dawn of the Modern REIT Era in 1994, the net lease sector has produced an average annual total return of roughly 14% per year, which is more than 200 bps higher than the REIT average. 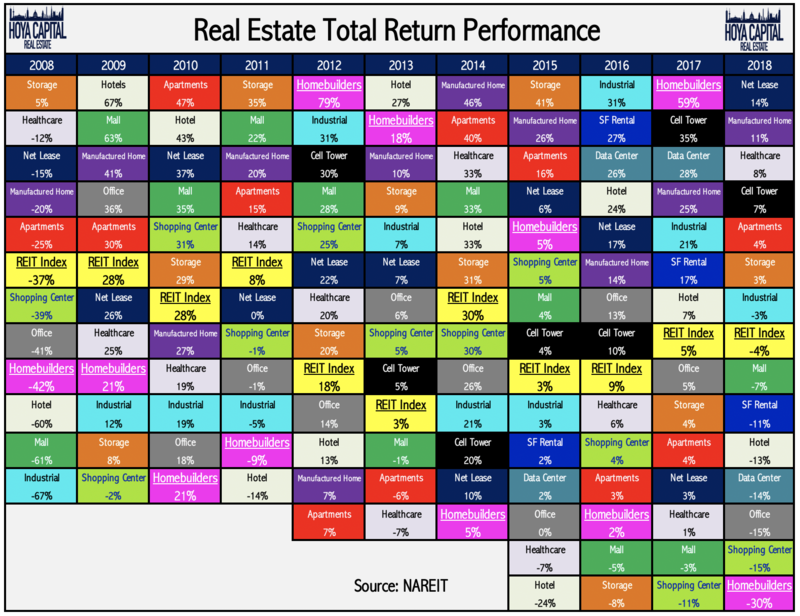 Net Lease REITs were the top-performing sector of 2018, producing a total return of 14% compared to the -4% decline in the broader REIT index. Whether fundamentally justified or not, the performance of the net lease REIT sector over the past half-decade has ultimately been driven almost entirely by movements in the 10-Year yield. While company-specific analysis can be helpful to identify relative outperformance within the sector, net lease REITs are ultimately at the mercy of global macroeconomics over the short and medium term. Net lease REITs were crushed by the post-tax-reform surge in interest rates that pushed the 10-Year Yield to its highest level since 2011. At this time last year, Realty Income was 40% off its record highs in 2016. Since then, long-term interest rates have receded as inflation expectations moderated, sending the Realty Income and the rest of the sector within shouting distance of all-time highs. 2019 has been good to the broader real estate sector, and net lease REITs have been no exception. After returning 14% last year, the net lease sector has climbed another 13% through the first 11 weeks of the year. The 10-Year yield has retreated another 4 basis points since the start of the year and is roughly 60 basis points below its peak last October. 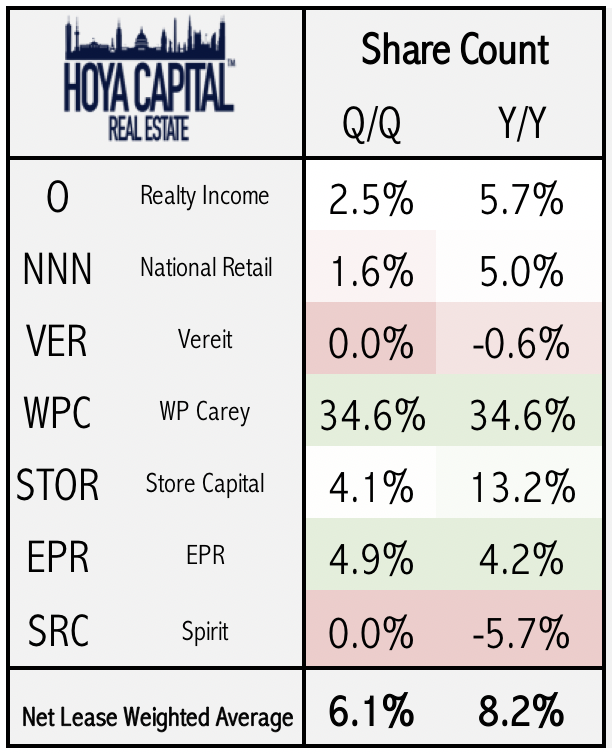 National Retail, Realty Income, and STORE Capital crushed their peers in 2018, producing total returns of roughly 18%, 16%, and 14%, respectively, far outpacing the next closest peer, EPR, which returned less than 5%. The tables have turned to some degree in 2019 as the underperformers of last year have led the way, highlighted by strong gains from W.P. Carey, VEREIT, and EPR. Similar to the trends we've observed in the retail space (Mall REITs: Only the Strong Shall Survive), we continue to note the significant bifurcation in operating performance between the two tiers of the net lease REIT hierarchy. Over the last several years, three REITs have separated themselves from the pack, which we dub the Power 3: Realty Income, National Retail, and STORE Capital. Unlike peers VEREIT, Spirit, and W.P. Carey, the Power 3 have kept their hands clean of accounting issues, tenant bankruptcy problems, and non-traded REIT complications. While the Power 3 have not been immune to the broader industry slowdown in AFFO growth, these REITs have widened their relative spread in AFFO growth above the rest of the sector in recent years. For full year 2018, these three REITs achieved 5.8% average AFFO growth and, at $3.5 billion, accounted for roughly 85% of the total net acquisitions across the sector. 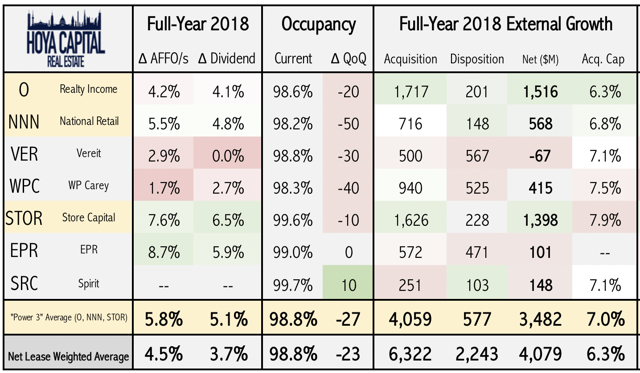 Excluding Spirit, which completed the spin-off of Spirit Master Trust (SMTA) last May, the sector averaged 4.5% growth in AFFO in 2018 and ended the year at 98.8% occupancy. While occupancy dipped a bit this quarter from recent record highs, by virtue of their experiential-oriented tenant mix, net lease REITs have so far been largely immune from the pressures of the so-called "retail apocalypse." As a whole, the sector generally exceeded initial full-year guidance given around this time last year from both an AFFO growth and net acquisitions standpoint. 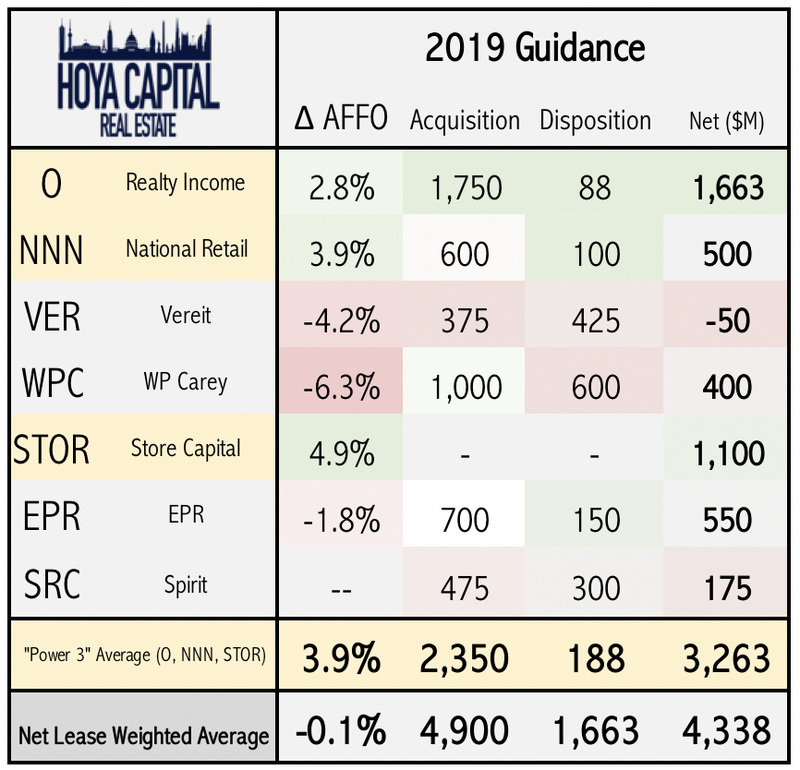 STORE Capital was the clear standout, delivering nearly double the amount of net acquisitions initially forecast and producing AFFO growth well above initial estimates. Heading into 2019, these REITs forecast a slightly more robust level of external growth, at $4.3 billion versus $4.1 billion in 2018. 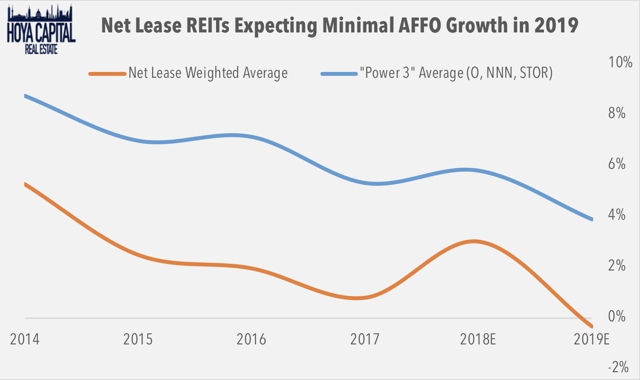 AFFO growth is expected to further moderate, but initial guidance appears conservative, particularly if the current NAV premium persists and net lease REITs are able to take advantage. 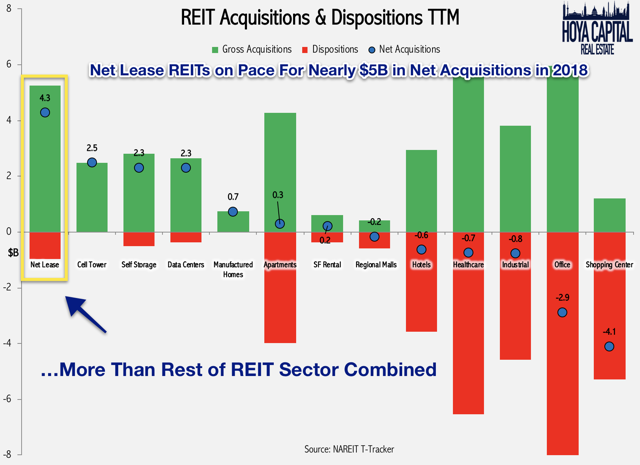 While NAREIT T-Tracker data has yet to be released for the past quarter, we noted last quarter that net lease REITs were one of the few REIT sectors in "buy-mode" in 2018, a strategy that appeared ill-fated earlier in the year given the disadvantageous cost of capital conditions. Highlighting the nimbleness of the sector (or perhaps simple luck), the external growth spigot seemingly re-opened just as valuations began to recover in early summer as interest rates and inflation expectations peaked. Third quarter net acquisition volume was the highest since mid-2015 and the fourth quarter data will likely show a continuation of that trend. While the Power 3 continue to plow ahead with external growth, Spirit and VEREIT have prudently shrunk their respective firms in an effort to regain the critical NAV premium, a strategy that appears to be successful thus far. Investors have applauded the share buyback implementation of Spirit and VEREIT and the moderate pace of acquisition activity. Overall, over the last year, the sector has expanded its share count by roughly 8%, boosted by W.P. Carey's share issuance to fund its acquisition of one of its managed funds, Corporate Property Associates 17. Before the rally began a year ago, net lease REITs were trading at the lowest valuations of the post-recession period. The sector traded at roughly 14x Free Cash Flow (aka AFFO, FAD, CAD) and a NAV premium of 0-10% on average with five of the seven REITs trading at a NAV discount based on consensus estimates which we discussed in Net Lease REITs Are Too Cheap, And That's A Problem. Well, receding interest rates did wonders to fix that problem, and the sector now trades towards the upper-end of its post-recession range based on FCFx multiples and NAV premiums. Based on dividend yield, net lease REITs rank towards the top, paying an average yield of 4.8%. 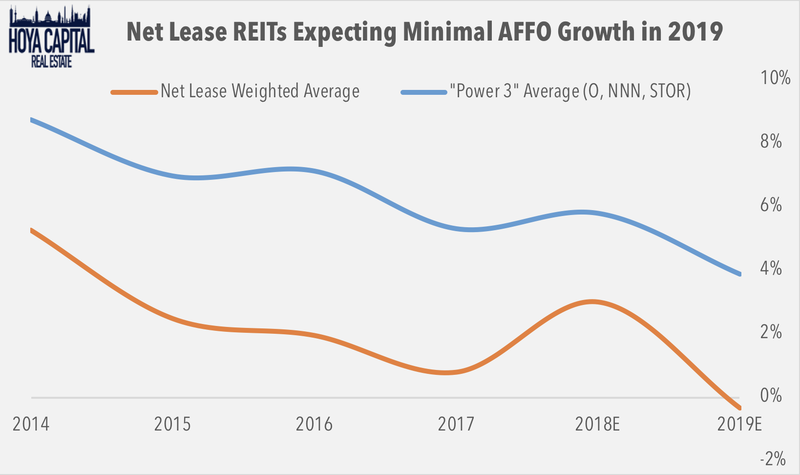 Net lease REITs pay out roughly 80% of their available cash flow, which leaves enough cash for acquisition-fueled growth and enough wiggle-room to buy back stock as needed to close a potential valuation dislocation. Within the sector, we see the yields and payouts of the seven names. The "big three," STORE Capital, Realty Income, and National Retail pay the lowest yields but have the largest buffer for future dividend increases and external growth. Net lease REITs are the most interest-rate-sensitive sector and one of the least sensitive to broader equity market movements. High interest rate sensitivity is a result of longer-than-average lease terms and high dividend yields. Net lease REITs are nearly twice as sensitive to movement in the 10-year yield than the broader REIT index. We separate REITs into three categories: Yield REITs, Growth REITs, and Hybrid REITs. All seven names in the space are Yield REITs and should be used by investors seeking immediate income and are willing to assume a higher degree of interest rate risk. At this time last year, net lease REITs were going through an existential crisis. Analysts questioned the viability of a business model dependent upon a favorable cost of capital. Just as "rates up, REITs down" punished the sector in early 2018, net lease REITs have bounced back since early last year as rates - and inflation expectations - have receded. The sector continues to be at the mercy of the macroeconomic environment and global interest rates are notoriously difficult to forecast. 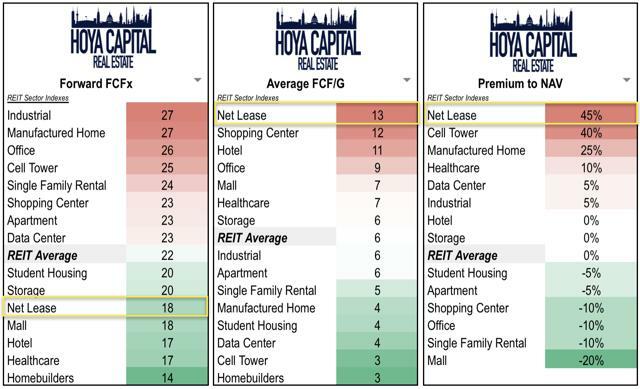 Since last February, the sector has surged roughly 50%, led by the "Power 3" net lease REITs: Realty Income, National Retail, and STORE Capital. The Power 3 weathered the storm in 2018 and now command the most favorable cost of capital conditions in years, potentially reigniting AFFO growth if macroeconomic conditions cooperate in 2019. If you enjoyed this report, be sure to follow our page to stay up-to-date on the latest developments in the housing and commercial real estate sectors. For an in-depth analysis of all real estate sectors, be sure to check out all of our quarterly reports: Net Lease, Data Center, Manufactured Housing, Student Housing, Single-Family Rentals, Apartments, Cell Towers, Manufactured Housing, Malls, Shopping Centers, Hotels, Office, Healthcare, Industrial, and Storage. Disclosure: I am/we are long VNQ, STOR. I wrote this article myself, and it expresses my own opinions. I am not receiving compensation for it (other than from Seeking Alpha). I have no business relationship with any company whose stock is mentioned in this article. Additional disclosure: All of our published commentary is for informational purposes only, always provided free of charge. Commentary is purely theoretical and not intended as investment advice. Information presented is believed to be factual and up-to-date, but we do not guarantee its accuracy and it should not be regarded as a complete analysis of the subjects discussed. An investor cannot invest directly in an index and index performance does not reflect the deduction of any fees, expenses or taxes. Data quoted represents past performance, which is no guarantee of future results. 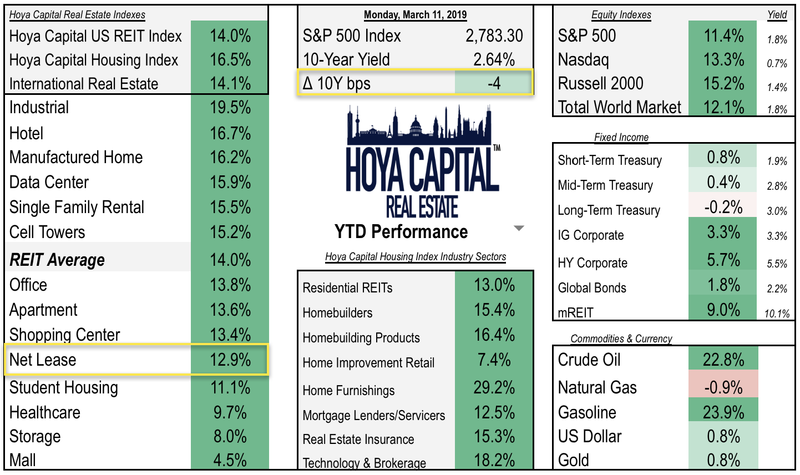 The information presented does not reflect the performance of any fund or other account managed or serviced by Hoya Capital Real Estate. Please consult with your investment, tax or legal adviser regarding your individual circumstances before investing. For complete disclosure, view our profile via the link above.